The same facts were born out in the Brexit vote in the UK and in the marriage equality vote in Australia where next to age, education was the other key factor determining the result with 77.9% of those with a degree voting yes. And disturbingly this is also true when it comes to those who support right wing parties such as Geert Wilders’ anti-immigration Party for Freedom in the Netherlands. The Financial Times conducted an extensive survey from the most recent election and found that education rather than other issues such as exposure to migrants, was the key indicator of a person’s likelihood to vote for Wilders – the more qualified the population, the less support for Wilders. It appears to be a fairly common trend that those with a University education are more likely to be progressive in their social attitudes and in their voting preferences. Some suggest that education is the new ‘divide’ in our world, replacing class as one of the key social indicators. Given this it seems like a bizarre time for governments, such as Australia, to be significantly reducing their funding for University students. In the most recent Australian budget the funding for Universities was cut by $29bn to be largely achieved by increasing student fees. But it is not just about getting into University, it is also about what happens when we are there, the quality of our education and curriculum more specifically. It has been my experience that Universities have changed a great deal in the past 20 years and are now more commonly focused on generating revenue from large scale research grants than prioritising teaching and facilitating the development of critical thinking skills in students. 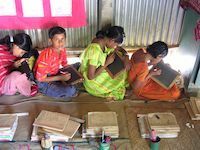 The whole question of access to education is a very complex one and involves other dimensions than just financial ones. If a child is not provided with their basic developmental needs in childhood this will impact on their life opportunities, including their engagement with education. This is certainly the case in our society and in other parts of the world where lack of access to education is an even more critical issue. Surely the imperative is to ensure that everyone, no matter who we are or where we live, has equal access to high quality and free education. If we were to get serious about this, and all the complexity that this involves, I suspect that our world would be quite different. Information is power, awareness is the key to change, and education is an important pathway to both. Informed debate is seriously lacking in our society – not just from people who want us to believe a certain thing, but from each one of us as members of our society. I have no interest in everyone believing what I believe or thinking what I think, but I also have little tolerance for those whose opinions are based in ignorance and fear. So much of the damage that we do in our world is the direct result of ignorance and fear. I want to live in a world where we are all part of an informed community, where we discuss and debate with respect, where we make good decisions together over time, and where we enjoy and celebrate our different perspectives. Moving closer to this is my hope for 2018. May 2018 be a year full of peace and kindness for you and for us all.